Welcome to my blog. Astronomy is a fantastic hobby. I started off with just a passing interest, but now it's never far from my mind. My earliest posts were all about observations, but now, I write about all sorts of astronomy related topics. Please feel free to comment, or subscribe to receive an email when I add a new post. Enjoy, and thanks for reading. Always exciting! A few weeks ago, I took delivery of my new SkyWatcher EQ6-R Pro mount. Recently, I posted a quick video of the unboxing and my first thoughts. Since then, I've installed the SkyWatcher Ascom drivers on my computers, done a couple of test runs with controlling the telescope from Cartes de Ciel and updated my license for Sharpcap Pro. Perhaps I will do a more thorough post in the future showing the exact steps I've taken. Back to the present. Over the last weekend, the forecast was excellent, and with no work to worry about, I was able to get a quality late night out with the new mount. I didn't really know what to expect, so I went ahead with a plan of polar alignment, 3 star alignment, slewing to and locking onto a target, guiding and eventually, if there was time left, some imaging. I put the mount together in daylight and was able to check level and balance. With no 'zero' positions on the SkyWatcher mount like I am used to with the AVX, it was a best endeavours type approach with getting it set up. There are setting circles on both axis which can be used, but looking briefly through the manual, I'm not sure will need to use these. Another feature of the SkyWatcher is the included polar scope. While the principles of this are very straight forward, it appears that it does take some time to calibrate, but I do have an alternative when it comes to polar alignment. Sharpcap Pro comes with a really useful polar alignment tool which I have used nearly every time I set up. So, mount polar aligned, and the 3 star alignment procedure complete, it was time to test it's accuracy. A quick trip around some targets confirmed all was accurate in that department. One of the main drivers behind me upgrading to the SkyWatcher mount was to try to improve my guiding to achieve longer exposures in my imaging. I was pleasantly surprised on how easy the next part went. I opened up PHD2 and connected it to my guide camera and mount. Over the last year or so, I have read up a lot on the calibration and the guide assistant of. Even though some say you should run the calibration steps in PHD2 first, I went straight to guide assistant and let PHD2 go through it's routine. It came back with a couple of suggestions, saying that polar alignment could be a little better and that I might need to consider guiding in one axis. Nevertheless, I applied the suggested settings and then forced calibration. Once all had been completed, PHD2 started guiding, and to be honest, the graph was looking pretty good. So far so good. Since the guiding was looking pretty good, I thought I would get some imaging time. With my AVX mount, the longest exposures I managed were around 60 seconds. To be fair, my results sticking to those parameters have been really good, but it's time to up my game. I turned to Sharpcap Pro once again. One of the biggest developments in this piece of software in recent times has been the inclusion of the Smart Histogram. It's a great feature that requires you to input how long you want your imaging run to last for. It then analyses the sky using your imaging camera before displaying a graph showing you the optimum exposure time and gain settings to use during your imaging process. It takes a lot of guesswork out of the process. It's the first time I had used the feature in anger, so I left it with 1 hour total imaging time, for which it suggested using 20 3 minutes exposures at 400 gain. I have neve shot at 400 gain before, usually imaging with 1500 gain. This was to be the proof of the pudding. A first test of a 3 minute sub and a check for any form of star trails showed no signs of any, so I let the software run off 60 minutes of light frames. So excited was I to have achieved all this at the first time of asking, I actually forgot to take my calibration frames, other than a handful of dark frames. 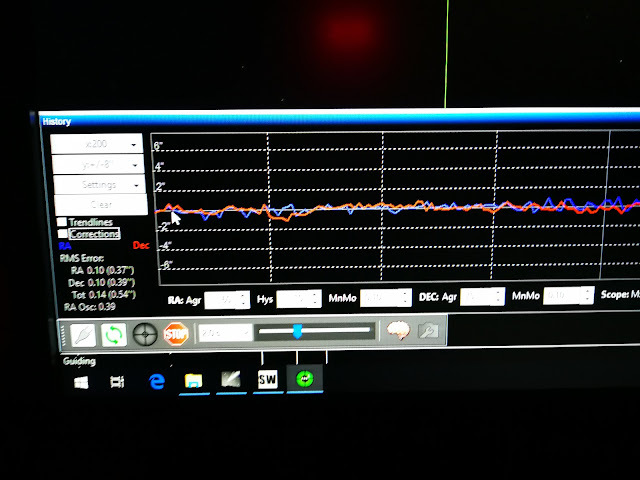 But the point of the whole evening wasn't to take an awesome image straight off, it was to test my processes of data capture And I achieved that with flying colours! That's not the end of the story though. I had collected some data, but missing flats and bias frames meant that whatever come out wasn't going to be as good as it could be. But I went ahead and did the processing anyway with the data I had. An hour or so of work in PixInsight allowed me to pull this image out of the data. This is the Bubble Nebula. 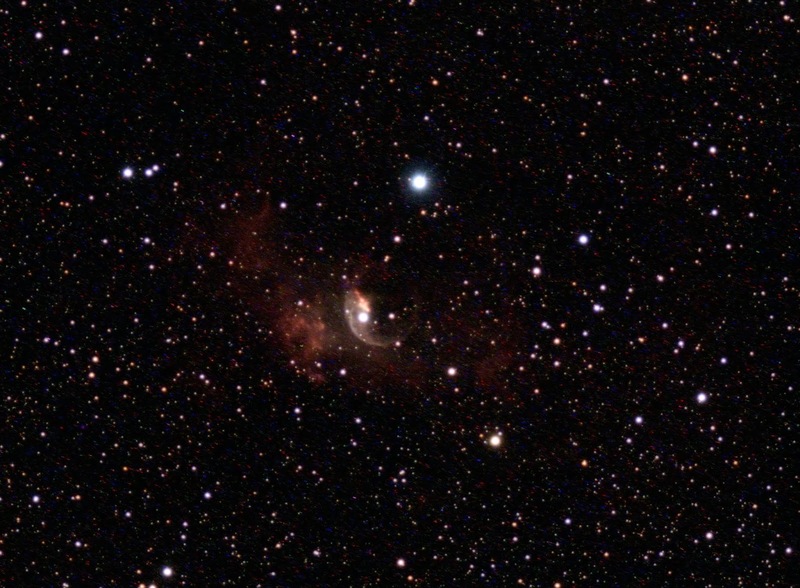 NGC 7653, a magnitude 10 nebula in the constellation of Cassiopeia. I can't wait to get back out and do it all again! Thanks for reading. Happy welsh bloke who likes loads of different things, loads of outdoor activities and just, well, loads of stuff really!